I love Alpha men as much as the next girl, truly I do. There’s just something about a man so utterly in control that hits all the right spots for me. And let’s admit it, among fictional Alpha guys, Vlad Tepes is the ultimate thrill. I mean, think about it – Vlad the Impaler… please note that I am trying so hard to ignore the pun potential and applaud my maturity… that Vlad, Dracul, a romantic hero! What’s not to like? Frost’s formula worked for me at the beginning. I expected to enjoy having Vlad as a hero and enjoy it I did; until I started reading Bound by Flames, the third book in her ever-growing series. Here it became clear that even I have my limits because by chapter two, the whole my-way-or-the-highway business started getting on my last nerve. Oh, Frost tried to redeem Dracul later on, and she even succeeded to a certain degree, but the bitter taste of his early actions never really left my mouth. For her part, Leila behaved quite admirably throughout. She refrained from rash decisions, she thought things through and she ended up winning every battle. But she rarely got there through conversation alone, and that told me all I needed to know about the couple. Frost pushed her boundaries in this book, possibly even a bit too far for some reason. I wasn’t bothered by the action or the torture, only by the relationship dynamic. With only one book left, I’ll definitely be finishing Leila and Vlad’s story. I just hope the two will find some balance or I will be very disappointed. I'm quite intrigued by Vlad Tepes as a hero, but overly alpha males end up getting on my nerves, so I'm not sure if this series/book would be for me. I do hope the fourth and final book will redeem the series for you, Maja! I still need to read the book previous to this one but that's disappointing about Vlad pushing things a bit too far. That's one that I have issues with too. So I guess I'll just be prepared for that. Hmm does this one get really dark? I don't know, knowing you, it won't be too bad. It was totally tolerable for me, the worst parts were skipped and it mostly just made me uncomfortable at times. I'm listening to this one now. I know what you mean Frost really pushing boundaries in this one. I'm really excited to get to the next book and I'm not even halfway through this one yet. I hope the next book works better for you. When it comes to alpha characters, it depends for me...sometimes it can be good but it can get pushed a bit too far into controlling/abusive behavior. 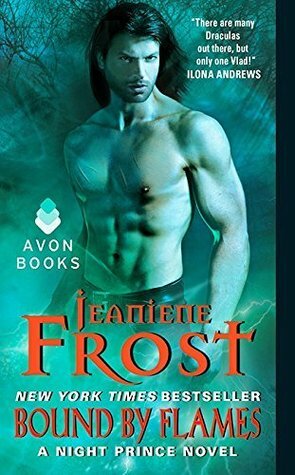 I haven't been a fan of Frost's work since she's heavy on the romance more than the plot and sometimes that doesn't work as well for me. I'm sorry to hear this didn't live up to your expectations but I hope this series bounces back soon, Maja! Oh that's too bad. Just the other day I was contemplating on reading the second book to the Night Prince, but after reading your review, I might be having some reservations. I mean, is it worth the investment of time? Hmmm. As much as I do love an alpha, the my-way-or-the-highway gets extremely trying, especially if it's still going on after three books. Flexibility, dude. Even just a little. Hmmm . . . I'm already a book behind in this series, and now that I know the next book is the last, I think I'll just wait for it before getting caught up. This one sounds pretty intense, and if I don't have the next book in front of me when I finish it, I might never read it.